hey guys……dis is superrrbbbbbbbb…………love u all soooo much……dis is the bst gift for all the admirers….!!!!! i jst love GAUTAM sooooooooo much…….he is the REAL KING OF EXPRESSIONS…..!!!! Congratulations to the team !! Wonderful website for the most amazing actor , Gautam Rode !! It is an ultimate gift for all the friends & admirers of Gautam Rode !! Thanks a lot , guys .We really appreciate the gesture & efforts !!! congrats buddy!! n one more thing i noticed is tht the website’s color code is of white n blue gautam’s favorite color..:) nyc..very nyc!! 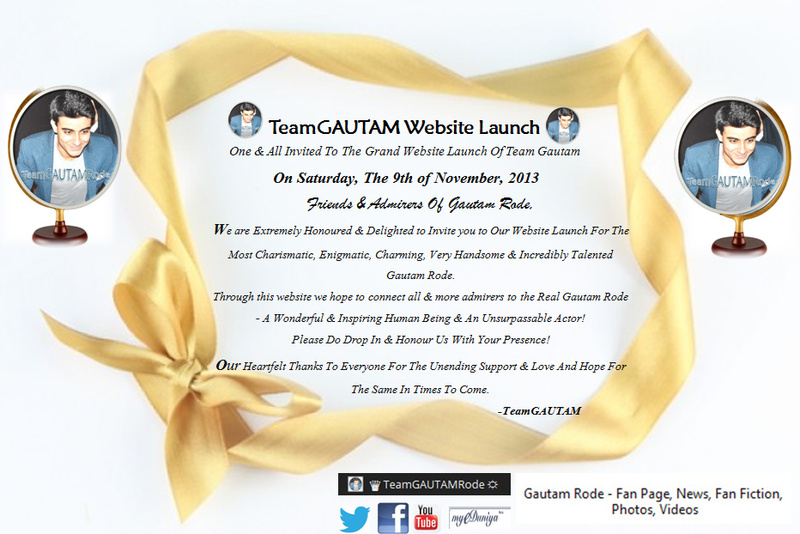 well done and its an awesome website, finally gautam have his own website to share with his fans. great job!!! Congratulations! You guys have done a splendid job! Absolutely love it 🙂 Thank you to Team G for always keeping us posted & Gautam Rode for interacting with us! 🙂 Good luck for all future endeavours! Its a great tribute to the king of expressions..!! Thank you so much..! !